Many confound what they think with what they know. With Marx, personal notions of Marxism often justify arbitrary conclusions, reflecting the perceiver’s prejudice, fancy or indoctrination. Any related discussion turns then into a vicious circle of arguments searching for proofs, and proofs that are but someone’s opinions. All this may be of disturbing obviousness, though it should be stated, given some equally disturbing notions, circulating at large within both the current and counter-current cultural streams. Far from me to assume expertise or academic Marxian knowledge. One must be in perfect health to read Marx, let alone his complete works. Besides, translating ponderous German sentences into simpler and more manageable English is a challenge even for seasoned translators. Which explains the many words still quoted in German, accompanied by the translator’s apology – that his English translation only approximately renders the meaning of the quoted German original. A situation has evolved where the current so-called ‘populist’ opposition accuses the neo-liberals of Marxism, actually of bolshevism. While the accused are indifferent to the accusation, for the origins of their philosophy was (and still is) improperly called “cultural Marxism,” as I will attempt to show. To account for this newly hatched paradox, a summary of the notions and facts involved is necessary. We may start with the often quoted F. Fukuyama, philosopher and employee of the US State Department, who proclaimed the “end of history.” For, according to this pundit, the first successful “orange revolution” – i.e. the destruction of the Soviet Union – coincided with the final stage of history, and with the entire world turned capitalist and neo-liberal. The only remaining task was to re-educate the misadvised ex-colonies about the ‘right way.’ Or even more Orwellianly, to wage genocidal wars to achieve capitalistic peace. The West would then establish worldwide ‘pax civilitatis’ (peace of civilization), at least according to the pop-philosophy of Karl Popper. The appellation of “desperate place” was and is wide and elastic. It ranges(d) from the island of Grenada, to Panama (1500 plus dead civilians), Iraq (first and second Gulf War), Libya, Syria, Yemen, Sudan, Afghanistan etc. Soon even Eastern European nations qualified and, of course the Balkans – we all know who is the current colonial master in these East-European crucibles of newly established happiness. It is as if the US extended the Platt Amendment to the world. The 1901 Platt Amendment guaranteed to the US the right to occupy Cuba militarily anytime when, in the judgment of the exceptional nation, “the quiet enjoyment of property, liberty and human rights were in danger.” Neo-liberalism before its time. In less Augustan language, the very essence of neo-liberalism is to never be at heart’s ease while one beholds a greater than oneself, (3) be it among men or nations. For in the end, the triumph of the strongest is also the salvation of the weakest. This has been particularly evident in some ex Soviet Republics – Ukraine, Moldavia, Georgia but not only – whose young now-abandoned males exported crime, and young females prostitution, into Western Europe. Something never seen, or even imagined, while these nations were subjected to the cruel Soviet yoke. But, as we know, the lure, the promise and the appearances of prosperity have dazzled stronger eyes, and disappointment is ever proportional to hope. The whole thing almost amounts to superstition, about which it is vain to conjecture; for what reason did not dictate, reason cannot explain. All this the world well knows, but how could neo-liberal ideology have anything to do with Marx, let alone Bolshevism? I know not by what fatality or by what confederacy, but it began with “cultural Marxism,” which, in my view is neither Marxist, nor cultural. Its seeds were planted in the 1930s, when a group of left-leaning academics in Frankfurt, Germany, invented what they called ‘critical theory,’ also known as the Frankfurt School. These luminaries found Marx inadequate to effect meaningful changes in society, and sought ways to correct his shortcomings. The ‘critical theory’ blossomed in the 1960s among leftist caviar-intellectuals in American and European universities. Today it dominates academia, especially in social studies. One of the most influential thinkers of this remarkable school was Herbert Marcuse. Even a cursory glimpse at what Marcuse said in print shows how the ‘critical theory’ has inspired and instilled a certain culture of inverted intolerance. A culture that now prevails in the caviar-academic world and, by reflection, osmosis and capillary action, in the world at large, thanks to the fake news media and the fake world of Hollywood. Social justice, feminism, neo-progressivism, post-colonialism, gender equality, multi-culturalism, and diversity are movements or ideologies inspired or associated with the ‘critical theory.’ And since the critical theorists saw themselves as new and improved Marxists, critical theory equates to cultural Marxism. Gender, sexual orientation, family, race, culture or religion – every aspect of personal identity is in question. Every norm or standard of society should be challenged and ideally altered so as to benefit supposedly oppressed groups. Historical Marxism opposed the bourgeoisie to the proletarians, in a class struggle aimed at a utopian or at least at a more balanced organization of society. Majority groups are typically defined as privileged and oppressive – with minority groups accordingly labeled underprivileged and oppressed. Heterosexuals, sexual conformists, whites and Christians are oppressive. Those that do not fit into these groups are thus considered oppressed. Consequently, if heterosexuals are oppressive the solution is to encourage other forms of sexuality. If whites are oppressive the solution is racial diversity, if sexual conformity is oppressive, the solution is to encourage transgender sexuality, if Christians are oppressors, the solution is to propagate Islam, etc. Different views are irrational fears or phobias. A person who feels uncomfortable living as a minority in an enclave dominated by Muslim migrants is an islamophobe, since wishing to live among those culturally and ethnically similar to oneself is considered sick or phobic. Another notably popular and propagandist manifestation of cultural Marxism is political correctness, in which media channel and academia question common language. Illegal immigrants are to be called undocumented migrants, while ethnic discrimination is described as affirmative action. Defining and redefining words is a means to control the discourse and alter cultural norms. An ethnic minority woman, for example, cannot be racist or sexist towards white men. Racism and sexism are a product of prejudice plus power, hence let’s promote a favorable view of groups that are marked as ‘oppressed.’ Therefore Islam is a religion of peace. Black Lives Matter is a peaceful, legitimate protest movement. Feminism is only about equality, etc. No criticism or deviation from this narrative is allowed. In the end, while communism offered a resolution of class conflict in a utopian social system, cultural Marxism offers a desolate form of eternal warfare between ever more narrowly defined groups of offended minorities. And so it has come to pass that thanks to Academia, lick-spittle of the ruling class, the alt-right, which is currently the only something that resembles a Left, can call the 1% Bolsheviks, while the ‘Bolsheviks’ laugh ever harder behind the back of mankind, and, naturally, all the way to the bank. The answer, in my view is no. To start, Marx advocated both a political and a humanitarian emancipation. Along with the economic emancipation of the working class, he promoted the removal of class dominion. In his vision, the revolution included not only the working class but the emancipation of nations – in his time he particularly referred to the independence of Ireland and Poland. And though Marx is associated with the notion of religion as ‘the opiate of the people,’ he equally considered religion as an essential ingredient in the formation of the nationalist spirit. 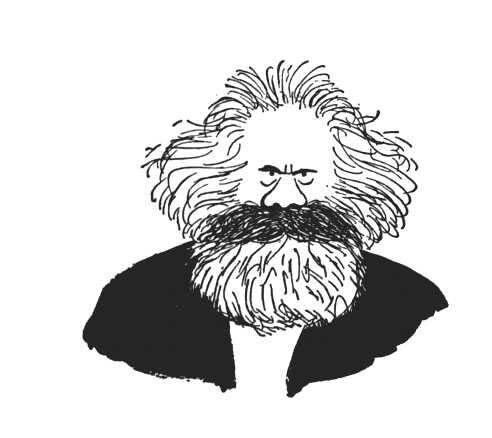 Marx advocated the elimination of slavery, but neither ‘diversity’ , ‘multiculturalism’ or ‘gender neutrality.’ He pointed to the class struggle not only as economic. He viewed the capitalist system as an assembly of more-or-less servile relationships imposed by one people on another internationally, by one class on another in one single nation, and by a man on a woman inside members of the same class. On the latter issue he was not alone. For example, French philosopher and mathematician Nicolas de Condorcet, in 1790, had already defined as an ‘act of tyranny’ the exclusion of women from political rights – and he equally condemned the ‘power of habit,’ which dulls the sentiment of justice. All these are ideas reflected and expanded in Marx’ writings. In other words, the cultural Marxists’ conversion of resistance to class discrimination into a universal classification of oppressors and oppressed, based uniquely on numbers, is arbitrary and unwarranted. Whether reason will in the end prevail and recover some influence, in academia and elsewhere, I know not. For whenever I pretended to the prerogative of foresight, I was mortified with a new conviction of the shortness of my views. This entry was posted in Amusing Shakespeare, Best Shakespeare Quotes, Philosophical, Psychological & Historical Considerations, Presentation Ideas, Shakespeare and Politics, Shakespeare in Politics and tagged After Dinner Quotes, best shakespeare quotes, effective communications, elegant shakespeare quotes. Bookmark the permalink.